Please check my previous post on Solina G2 for background info. When v2.5 of the patch was ready, I intended to sell my Solina String Ensemble. For various reasons this took quite some time Unfortunately, the power supply broke down before the Solina was sold. Thus, I had to do even more repair work. After replacing a burnt resistor and fully recapping the power supply, the Solina was again fully functional. In fact, it was more "fully functional" than before! I think the power supply problem had been there for a long time, gradually getting worse and causing increasing symptoms. After repair the Sustain suppression trigger started working. I also discovered that only the string sounds should be affected by the Crescendo (=attack) envelope, but not the brass sounds. So it became necessary for me to further modify my Solina G2 patch. Sustain suppression means that sounds with long Sustain keep slowly decaying after all keys are released until a new key is pressed. Then the release is shortened, allowing the new note to be more clearly heard. This is implemented using envelope release time modulation by a short negative pulse triggered by the positive edge of MonoKey gate. To save VA patch load the trigger is derived in the FX area and sent to the VA area through Bus 1. Sustain suppression can be disabled using parameter A2:7. 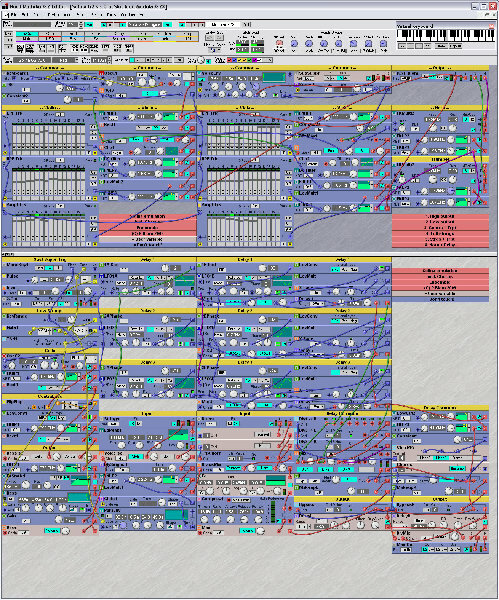 Separate envelope handling for string and brass sounds is accomplished by sending all polyphonic sounds (Violin, Viola, Trumpet and Horn) separately to the FX area. There the sounds are monophonically processed (violin filtering, string envelope, brass select logic, eq, compression) and sent to the chorus ensemble. Due to a phase shift somewhere (either in the Solina brass filters or the G2 brass filters) the phase relation between strings and brass on G2 is incorrect. By inserting a very short delay in the string path this problem is minimized. Combining string and brass sounds on G2 now gives a reasonable approximation of Solina. The previous simple low pass filter tone control has been replaced with a Eq 3 band module for more precise tone shaping. Flat eq gives the frequency response of Solina output 1 (high). The eq settings of variation 2 are an attempt at simulating the frequency response of output 2 (low). The sound mix pre-chorus effect send is slightly compressed to simulate the compression-like effect inherent in a top octave divider type instrument. A stereo delay has been added at the end of the signal path. Filter settings for all sounds have been tweaked. This is a demo recording of the patch. No external effects are used. The first part demonstrates variation 1-6 with a few tweaks, mostly trying to sound musical. From 2:45 a single variation is used and various parameters are tweaked to show the range of control. The latter part of the demo is probably rather boring, but allows a more accurate comparison to a real Solina. If you have a G2, you are advised to download the patch and try for yourself instead of wasting time on this non-streamlined demo. I really enjoy your patches, it's always like buying a new synthesizer. thanks MASTER! And now...a SMALLTONE phaser, and we will happy!!!! 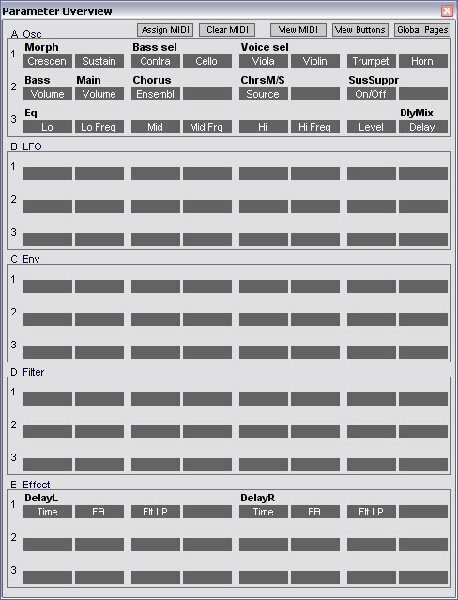 Had to make the chorus ensemble output strictly mono in order to afford the added patch load. Used half of the stereo phaser from my Ensemble G2 patch. Was able to retain the stereo delay from Solina G2 v3.0. The phaser and stereo delay controls are mapped to parameter pages E1 and E2. Effect bypass switches are mapped to A2:3-5. The phaser can potentially cause overload. Since the Main Volume control (A2:2) is located pre-effects, you can use it to avoid distortion. Thanks for this. After seeing the Waldorf Streichfett my next thought was "I wonder if some genius on electro-music made a Solina emulation on the G2." Then some months later I started looking for a way of making a stereo phaser and my search led me to this same post. This patch is sick. All my life I was looking for a reasonable emulation of this classic machine. How did you achieve this? Did you study the original circuit? It is so warm, wide and fat! Here I am commenting on a patch that is 9 years old. I added some MIDI control mappings to version 3.0 of the Solina patch to control it from a Nord Electro 4D. The rightmost six drawbars control the six stops bass, cello, viola, violin, trumpet, horn. (You can't use the leftmost six, because they would require MIDI CCs 17 and 18 which the G2 reserves for other purposes). The chorus effect switch on the Electro controls the Ensemble effect, the delay mix knob controls the delay mix, and the EQ knobs control the EQ. It's a very nice setup, like adding another instrument to the Electro on par with the organs and pianos.